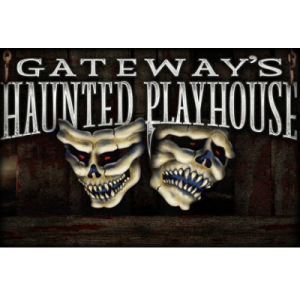 Gateways Haunted Playhouse is a Haunted Attraction located in Bellport, NY. 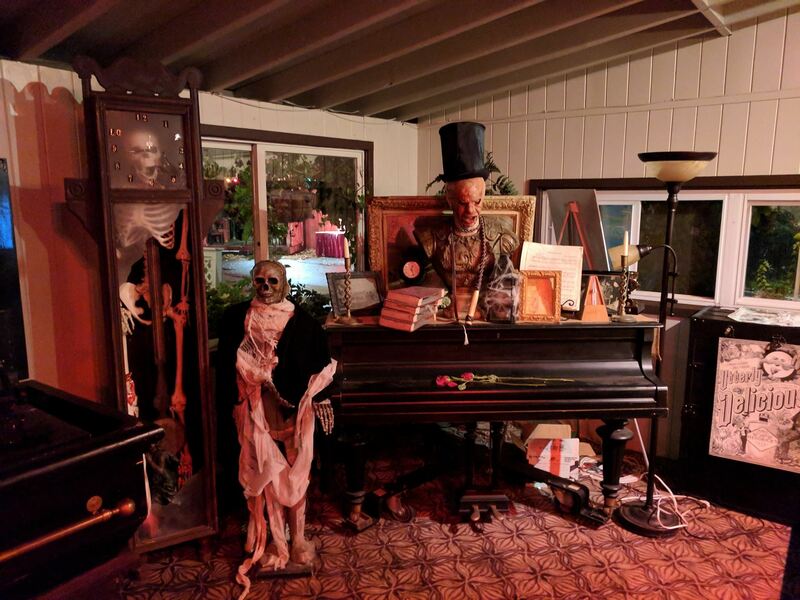 Team Hallowoosh reviewed this attraction on October 25, 2017. It had been thirty five days into my 2017 haunted house season and a whole thirty four days since rain tried to effect my schedule at all. Alas on the only night that I decided to stay on New York’s Long Island it began to rain. 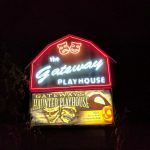 I would not be detoured by it in the least because Gateway’s Haunted Playhouse has been a haunted attraction I’ve been wanting to see for the past several years. Come Hell or high wind this was one of very few haunts in 2017 I wouldn’t miss. 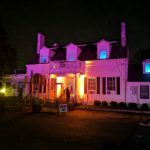 The Haunted Playhouse is put on by The Gateway Playhouse in Bellport, New York. Almost a two hour drive from Manhattan. 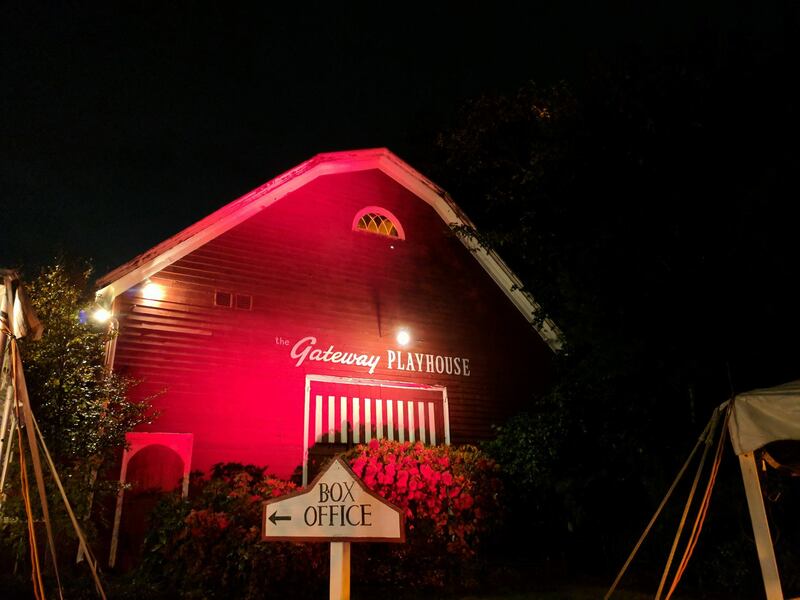 The Gateway Playhouse itself is one of very few theaters left on Long Island. 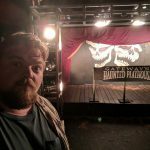 Each year they put on a slew of great shows, making the build for this particular haunted event one of the most impressive works of labor I have ever heard about. 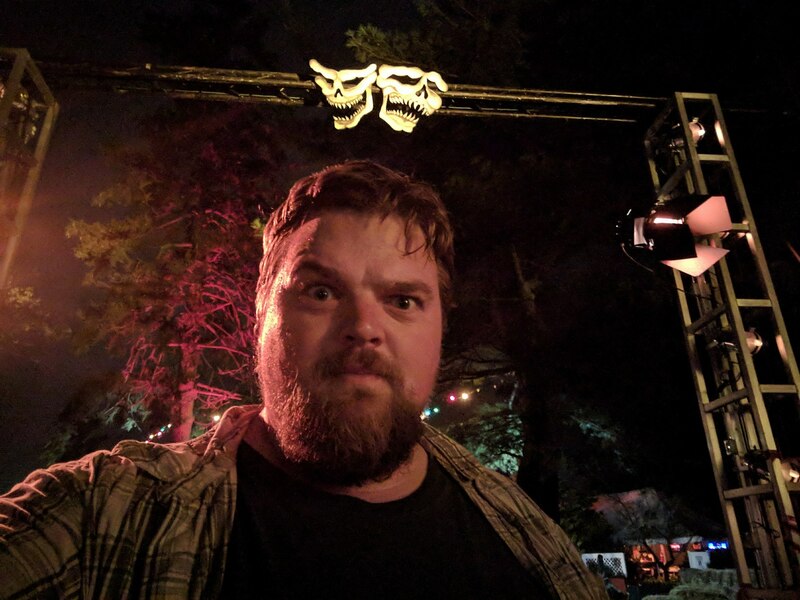 The managing producer Paul Allen tells me when the last show of the summer ends they have only ten days to get the haunted attraction up and running. I’ve seen people working on front lawn displays in July and complaining they don’t have enough time to finish. First thought would be a haunt that is only given ten days to put up their attraction can’t possibly be worth the money. The Haunted Playhouse builds an attraction that feels like it took years to make and just as long to take down. I was already excited enough to see this show, I was very impressed with the production, and to learn about what actually goes into making the show made it that much better! This isn’t a haunt to pass up on any year! The first actor I saw was a very evil looking scientist who acted more as a queue line entertainer while I received a little bit of the back story for this years show. He said absolutely nothing and didn’t even make a sound but he was terrifying. He checked for names on a clipboard and stared at me with crazy soul piercing eyes while he shook his head. Apparently I was not a good candidate for the experiments or maybe I was the perfect candidate I have no idea. All I know is that he made me feel like I was about to go through something crazy. Once I was past the official point of no return I noticed that much of the actors were very much a unique form of zombie-like creature. A few of them would be the ones to hide behind something and pop out as I walked by but many of them had their own sounds and moves I was not used to hearing and seeing. One of these actors had a very peculiar sound that I can only describe as like a screaming howling monkey crossed with the cackling of the Predator. At first she popped out much like the other actors would and I paid little attention. That hooting sound came out of her mouth and I didn’t know what to make of it other than to get away. At some point I left the indoor haunt and made my way through an outdoor maze. A giant beast of a man guarded the entrance back into the house. It was raining slightly but I wouldn’t care if it was hailing golf balls, there was no way I was getting past this guy. There was a green light on the wall behind him so I was mainly looking at his figure but he kept me waiting outside for awhile to let the group in front of me go ahead. It felt like forever but not once did this monster break character. The body language was telling me if I moved a muscle he would rip it off me. So I stood there motionless and silent the whole time until he offered safe passage. Another great actor burst into a scene with the screechiest scream I’ve ever heard. I had take a few good looks at his mouth to make sure there wasn’t some kind of sound effect hidden behind his teeth. It’s what you would think a Pterodactyl would sound like and it was horrifying. I had the pleasure of getting jumped by him multiple times because he could haunt the three rooms around him. Being a theater company you would think that the whole cast would be made up of actual actors who perform on stage. They tell me it is maybe half and half of theater performers and seasonal actors who only do the haunted attraction. Although, it wasn’t easy to tell who was professional and who was amature. 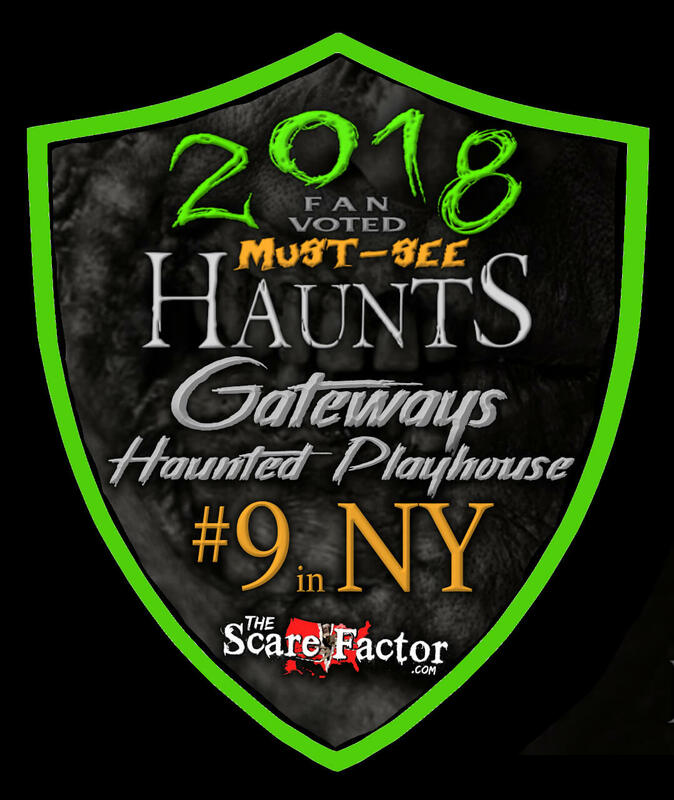 The haunt isn’t designed in a way where some actors are given their interactive stage to give guests a deep look into their character while other actors hid behind a wall waiting to scream. The cast felt like they all had their particular places based on what they were willing to do and they were good at doing it too. 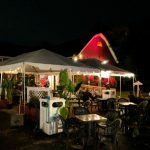 But no one felt like they were given more of a spotlight based on experience or performance capability, it felt like a haunt family that worked together. 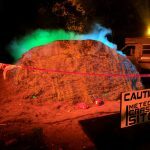 This year the haunt follows a theme that requires a large amount of hazmat suits. No surprise to find that many of the actors wore them or at least some sort of gas mask. Some actors were scientists with bloody and dirty lab coats. Others were either patients or experiments in hospital gowns or victims suffering from the pandemic. I actually very much respect an attraction that can break away from the norm of having multiple characters and sticks closely to the theme of their choosing. I didn’t find a clown or a redneck or any of the real traditional characters you would find at a haunted attraction. I was expecting to see at least a few of them when at some point in the show they would break away from the theme for a few minutes and try something different. But Gateway decided to stick to the main theme the whole way through. The makeup was fantastic. I was surprised to learn that all of the prosthetics were made on-site. Practically all of the actors had some sort of cut or bruise. A few of the scientists had bulging foreheads from the radiation or the chemicals from the experiments. The majority of the masks were gas masks or something to make it look like an occupation rather than just a scary monster mask. From the road it looks like the Gateway is just a small little white house. Not knowing any better I made my way into the white house to get my ticket and waited till someone told me it was my time to enter the haunt. They guided me into a hallway where a man sitting at another booth looked like he would take my ticket. He told me to keep walking and go outside. Confused, I walked out of the side porch of this little house and realized that there was a mini carnival happening just a few feet away. I’m sure anyone who has ever been to the playhouse before would know exactly what this place was but for a first timer I had no idea where the actual theater was located. They have a great midway at the playhouse. The most impressive thing they have is a laser animatronic shooting gallery. You pick up a laser gun and shoot the little targets to make a bunch of scary things happen. A skeleton comes through a painting, a zombie hangs from the ceiling, cabinets open and close on their own, etc. It’s actually really fun to watch all the things moving at the same time. They also have a Last Ride coffin simulator that has it’s very own booth. Your friends can sit down in haunting chairs watching you inside the coffin. There is a book with a quill pen writing something down but nobody is holding the pen. The coffin itself is not like the regular shiny black wooden ones you see all the time. This one is actually aged and creepy looking. 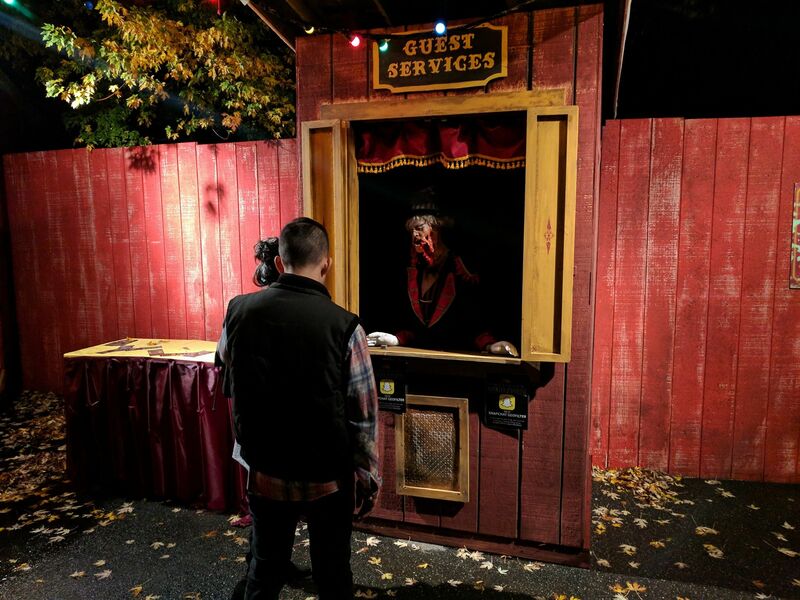 They even have a guest services booth where you can talk with a mutilated carnival director. On certain nights they have a juggler and fire dancer on their stage. Snacks and drinks are served outside in a large concession tent. Beer is served inside the lobby of the playhouse. 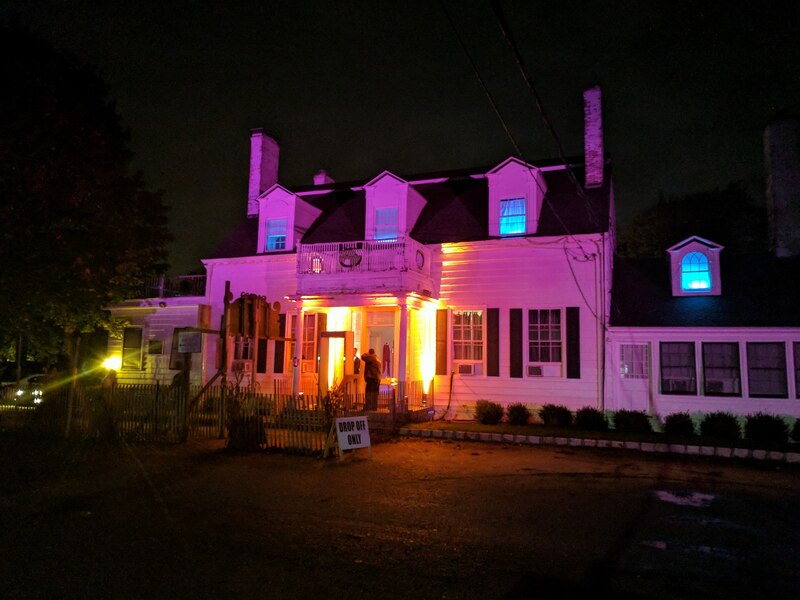 The little white house where everyone buys their tickets has some creepy music and lights but not enough to tell this is a haunted attraction from the street. The illuminated sign on the street might do the trick. 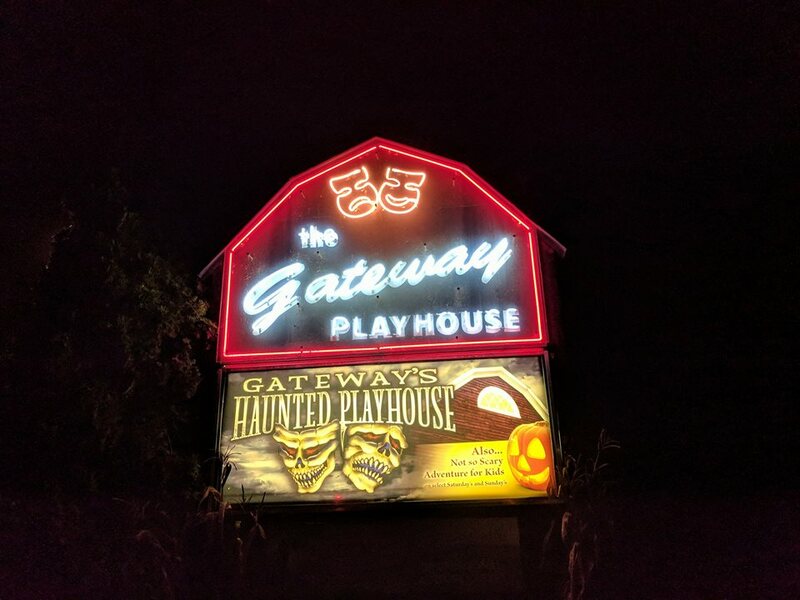 There isn’t much on the road leading to or from The Gateway Playhouse so it’s very hard to miss the big glowing neon sign with the comedy and tragedy masks. For the season they put up a big banner with their own skeleton versions of the comedy and tragedy. Inside the midway there is plenty to see all around that shows this is a Halloween event. 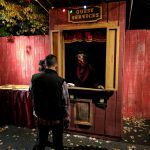 The shooting gallery, the coffin ride, the mangled guest services booth, even the signs for the concession stand and ticket line are themed specifically for this event. Walking into the midway they leave a little display that gives away part of the theme. A big smoking and glowing rock next to a bus that says “Brookhaven Laboratories” is within arms reach from the path. 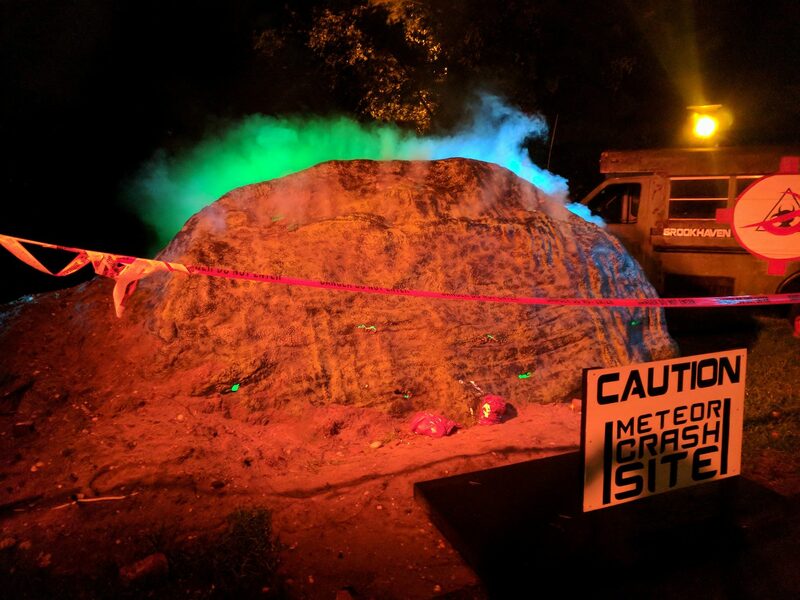 Another sign in front of the rock says “Caution: Meteor Crash Site” At first I thought this was probably just a fancy Halloween display that had no real relevance to the haunt itself. Oh, how wrong I was. The first big effect caught me off guard outside. There is a long corridor outside where I had to walk through a few different types of gates. One was cloth and the next was wood and the next was pickets with burlap hanging all over it. I was too concerned with what the next gate was going to look like, since it seemed they were all changing, that I just realized the biohazard barrel a foot away from me was projecting a fresh mist of water directly at my face. The laser swamps seem to have been getting extremely popular this year. 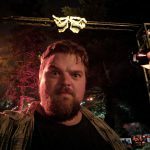 By the first week of my haunt adventures I was looking to see if anyone would be doing something a bit more creative with them. The hand or head popping out of the green surface just wasn’t doing it for me anymore. The actor in the laser swamp at Gateway almost looked like he was standing on the other side of the room when I entered. Thinking he would lunge at me sooner or later I just made my way towards him. Suddenly he started coming at me very fast without moving his legs and it freaked me out. I found out he was simply on a rolling chair and that’s all it took for me to have restored faith in the laser swamps. At some point outside they were playing an old broadcast of what I think was Orson Well’s War of the Worlds. It helped maintain the theme at the moment because I was outside for quite awhile with no real great representation of the theme around me. The broadcast was played at a few different spots and it gave a little bit of an impression that this chaos was all over the planet instead of just right where I was. The giant head creatures aren’t exactly a new thing but they have been getting more popular in the last few years. I fall in love with all of them everytime I see one. Couldn’t believe I would find one in a place like Gateway that is obviously trying to utilize every square inch they have to offer. At some point later on in the haunt they had this massive ogre looking head that came out of nowhere. It looked like the thing was covered in warts. It could have been covered in anything really. Anything that has a mouth as big as me you can count on me whimpering away like an elephant scared by a mouse. The effects just keep getting more and more elaborate the further I journeyed into the haunt. The most unique thing came at the very end when I walked across a control panel with multiple buttons saying “push” and I couldn’t resist. I pushed one button and heard the train whistle blow in another area of the haunt. Another button and I hear clappers down a hallway. Another button and I hear an air compressor activated. Looks as though the pushing of these buttons actually triggers some of the effects in the haunt and I very well could have been scaring multiple groups of people at once. 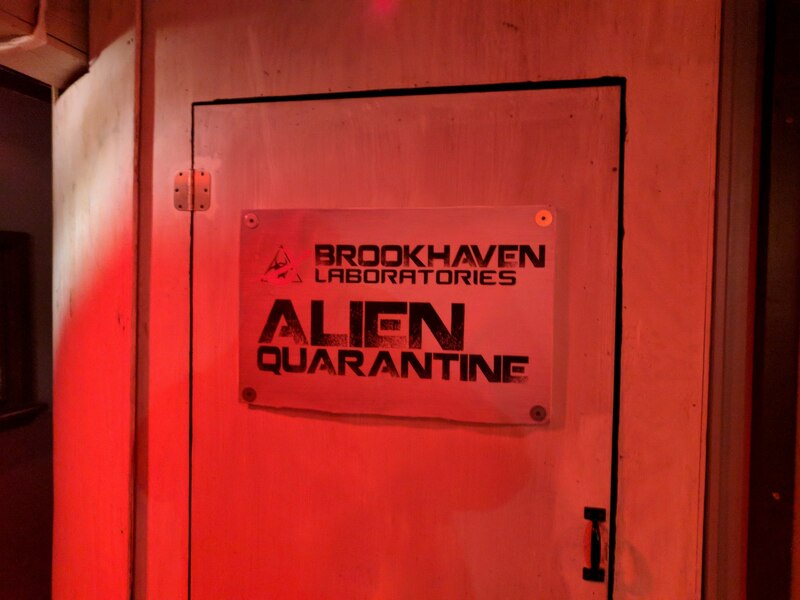 This year The Gateway brought us into the world of a the Brookhaven Laboratories who decided to not only investigate a meteor crash but also apply it’s effects to unwilling patients and unsuspecting victims. Little did they know the effects would cause so much death and chaos. We start with a short video introduction of Dr. Austin J Platt. He tries to explain what he wants with us and what he hopes to accomplish but is abruptly interrupted by some sort of terrible accident. 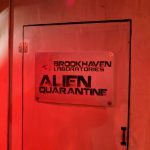 Quickly making my way into the laboratories the procedure seems painless and redundant. Soon everything starts going wrong and the mutated subjects begin to attack. It becomes very clear to me that I will have to get out alive only by going deeper into the mutation Hell that surrounds me. Gateway does an incredible job putting equal amounts of attention between their cast, sets and their effects. Nothing was overpowering or too close to one another to take away from any other scare. The cast was placed out perfectly where effects were not and effects were left to do their job and gain the appreciation they deserve. Actors were hiding in all kinds of places I didn’t expect to see them. They came at me from above, below, even from a distance. I never knew where the next scare was coming from. Most of the effects were custom made by the Gateway crew. 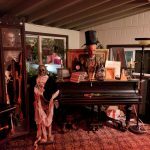 A lot of the props and crazy animatronics I had never seen before! Going through as many haunts as I do, it becomes increasingly more difficult to frighten someone like me. 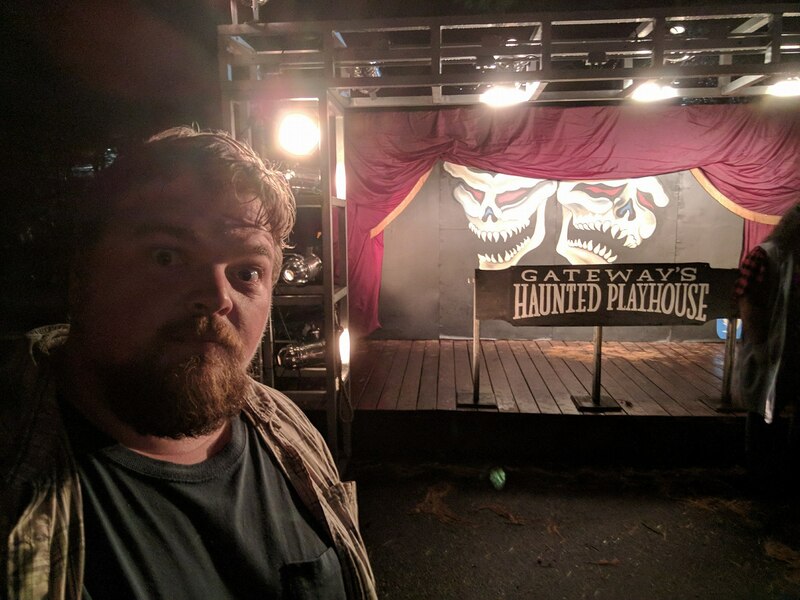 I honestly had plenty of moments in Gateway’s Haunted Playhouse that I really didn’t want to see what was around the corner. General admission tickets cost $35 at the door but only $30 online. A fastpass is available for $45 at the door and $40 online. It took me almost 29 minutes to escape a terrible fate. Although it looked like the majority of the guests there were very familiar with the online purchase, as they should be, I feel it is only fair that I stay consistent with the ticket prices at the door. 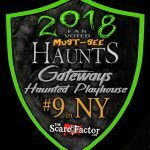 This gives Gateway Haunted Playhouse a minutes to dollar value of .83 meaning you are spending a tad bit over a dollar for every minute you are in the haunted attraction. The quality of this attraction is extremely rare in my experience. The work and dedication they have poured into the heart of this show is damn near insane. The show is ready to go on opening night but they are constantly adding new and exciting things throughout the season. 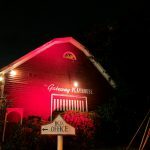 Although I haven’t been to many of the haunts on Long Island I would absolutely recommend Gateway as one of the greatest. I would even go as far to say it is one of the greatest in the North East. 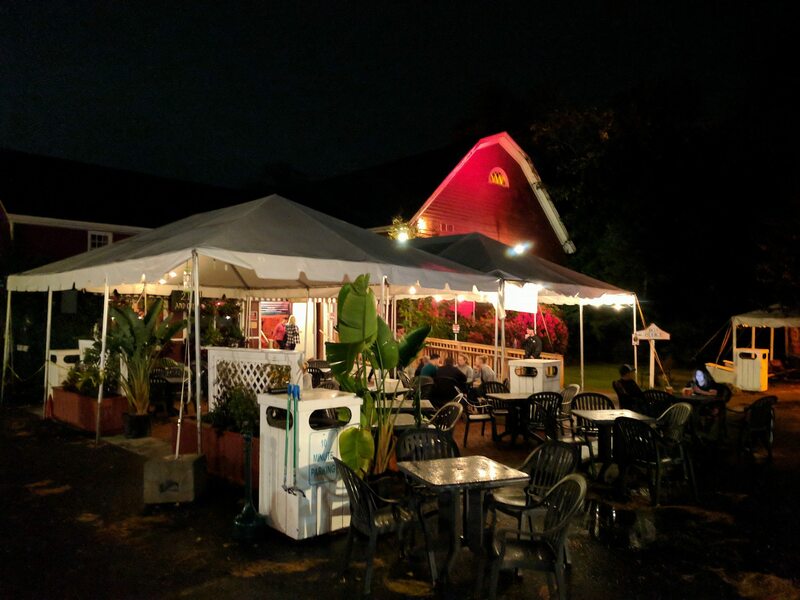 With the beer garden and all the fun things to do while you wait to go through or decompress on your way out, this is not an attraction you will want to miss!